Writing a review is not as easy as people think. It is not just about reading, viewing or listening to a work of art and writing glowingly about it, or dismissing it with a few strokes of the pen, or key strokes, as it is these days. True, you approach some reviews with care, especially when the artist is friend or family and a bad review may put paid to the economic success of their artistic expression, however a good reviewer knows to tell the truth at all times. No, this is not as impossible as it sounds. Since a review is about the good and the bad of a product, any product, a good reviewer can either focus on the good more than the bad or the other way round. This way, the truth is told and the reviewer gets to keep his integrity. To tell the truth, it is easier writing good reviews than bad reviews and this is primarily because it is easier reading, viewing or listening to good works of art than not. I don’t see myself as a reviewer, not a professional anyway. I am in simple words a consumer who has answered the call to provide feedback on works of art I come across and feel strongly about. Of late, there have been calls for artists, especially writers, to embrace the peculiarities of the internet, to create platforms that will pander to the dictates of modern living, to take the short attention span of the multitasking internet user into consideration, to evolve with the times. Many online publications have tried this, but most seem to lack that special thing that captures the essence of the advice. These failures may have more to do with not understanding what is needed, than with anything else. The meat of all these talk about reviews, attention spans and the internet generation is Klorofyl. Klorofyl is one of those answers you seek, those ones you know lie somewhere at the back of your mind and yet can’t grasp, those ones you touch but can’t recall for the life of you, until GBAM! Klorofyl is a digital magazine that hits you from the first page and gifts you a Eureka moment. You think, this should be me, I should have thought of this, this is my idea of an online magazine. It is funny, but the truth is that you never really thought about it, but the concept is one of those simple ones that must have taken serious thought and planning to achieve. I didn’t know about Klorofyl—beyond a mention here and there—before I got the third edition via a writer friend who was featured in it. This third edition, “the city issue”, appears to be a continuation of the magazine’s focus on literary and graphic art and it does it with aplomb. If the fluidity of the “Captains Log” that introduces you to the magazine does not convince you this magazine takes its topic serious, the beautifully done cityscape of the content page should. You know, just as you feel it: this is one of those outstanding ones. The theme is city and the writers, photographers, poets and graphic artists that Klorofyl collected, delivered one of the best odes to the concrete forest that I have seen in a long while. Jibola Lawal begins the offerings with an evocative picture of school girls probably on their way home from school and an endearing flash fiction “The Bariga Philharmonic”, a story of the city of Lagos at night, of the humming of the mosquitoes, vigilante gongs, snoring spouses, and generator buzzing- all that makes for an annoying harmonic. This flash fiction effectively opens the book and the beauty it conveys is replicated across the magazine. Story after story, picture after picture, Klorofyl celebrates the city in a myriad of ways that are beautiful and redolent in their familiarity. This edition, as I said before, is dedicated to the city and the treatment is classic. Tosin Otitoju, Dami Ajayi and Olatunde Asagba used poetry to express the theme and gifted us beautiful poems that could only have come from poets of their statue. The general idea, I feel, is a conscious effort to engage with the reader through beautiful prose, poetry and visuals. The attempt in my opinion is a resounding success. The stories are short, very short, and there is no monotony to it. The photo essay on Makoko by Leke Alabi-Isama was exquisite, same for the essay on New York by Olubunmi Ode, David T Msimanga’s “A Day in Town” Olatukunbo Ayorinde’s “Rising”, and so on and so forth. Klorofyl’s City issue may have Nigerian leaning, but it is not overly so, not that that can be helped as most of the contributors are Nigerian, but the magazine still manages to evoke a global appeal as it touches South Africa, Zimbabwe and Asia. There was nothing not to like about this magazine, at least I am still searching for something not to like. The truth is that liking or not liking an artistic work should be determined by individual tastes. However, in this age of multi-tasking, that burden has been passed on to the reviewer. The reviewer is supposed to make that choice for others. You read, view or listen to an artist’s creation and you pass judgments. It is this judgement that is difficult. For Klorofyl, I have a a judgement and it is thus: A high quality magazine tailored for the multi-tasking reader whose attention span is limited. 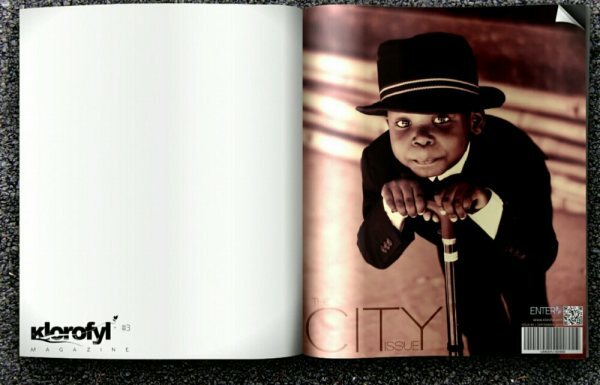 For the City Issue I say, Exquisite!